We can’t evaluate NFL talent in a vacuum. It’s not like the NBA where we know LeBron James is going to get his stats no matter where he plays. And it’s not like MLB where we can isolate statistics independent of surroundings. As the ultimate team sport, football players are extremely dependent on their coaches and teammates. So the most important part of evaluating free agency fallout isn’t talent, it’s fit and opportunity. Players ascending to bigger roles within their own teams thanks to a departure are often safer projections than big-ticket free agents signing with a new club. We got a taste of that last year in the form of free agent flops Trey Burton, Carlos Hyde and Dion Lewis. These are the biggest fantasy winners from the free agency and trade market so far. The Bucs moved on from both DeSean Jackson and Adam Humphries this month, opening up a massive 179 targets. The good news is they have just the man for the job. Chris Godwin lit up the Big 10 for 2,083 receiving yards and 16 touchdowns in 2015 and 2016. He showed at the Combine his athletic measurables aligned perfectly with elite fantasy wideouts. And when given opportunities in the NFL, he’s produced to the tune of 2.03 yards per route run in 2017 (13th among 107 qualifying wideouts) and 1.81 (28th) in 2018. Jackson has missed six games since Godwin has been in the NFL, resulting in four games with at least 98 yards and four touchdowns. Vertically-minded and pass-centric offensive play-caller Bruce Arians will find out very quickly he has a unique talent in Godwin. The Browns have something special brewing on offense. 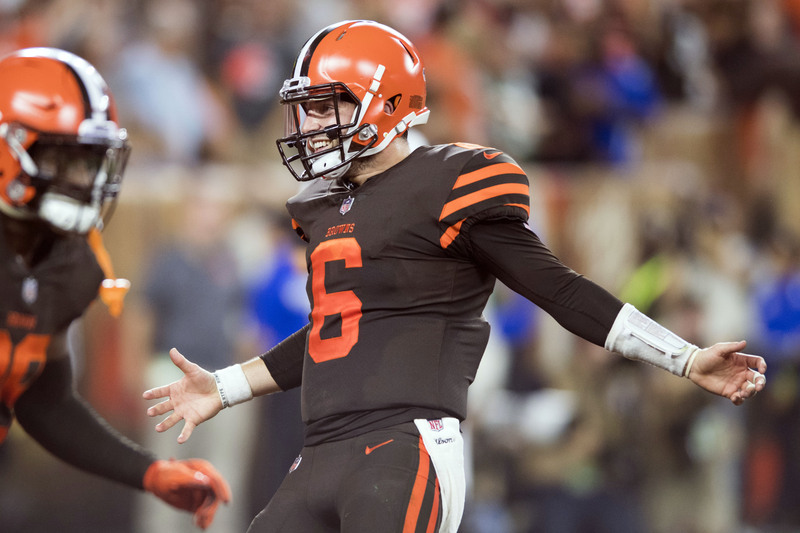 Baker Mayfield had one of the best rookie quarterback seasons in recent memory despite the brutal struggles of Antonio Callaway, gross misuse of passing back Duke Johnson and limitations of Jarvis Landry. Now Baker gets to play with true blue-chip talent Odell Beckham, whose 2.6 yards of separation on targets vs. press since 2016 leads the NFL (via NextGen stats). He also has the reliable underneath target in Landry, PFF’s No. 1 RB last year in Nick Chubb and an athletic freak in David Njoku who is still just 22 years old. As for Beckham, escaping the toilet-circling play of Eli Manning for the highly accurate and aggressive Mayfield is a huge win, even if his target share takes a slight hit. For the cherry on top, the Browns’ new offensive coordinator is Todd Monken. This is not some old-school, ground-n-pound donkey running halfback dives on 2nd-and-10. Last season, Monken’s Bucs were 6th in pass/run ratio, second in pass yards per attempt and 1st in pass yards per game. Both Jameis Winston and Ryan Fitzpatrick were in the top-three for average depth of target. He doesn’t shy away from talking about “throwing to win” and similar to Mike Leach, doesn’t consider “balance” to mean an even amount of passes and runs. “Balance is multiple skill players touching the football,” Monken said last month. Volume, efficiency and raw talent are all on the side of Mayfield and Odell this season. The rudderless Giants will try to implement a run-heavy, ball-control, defensive-minded plan in 2019 as the coaching staff attempts to hide Eli Manning’s incompetence. It won’t work. Saquon Barkley is a candidate to see more eight-man boxes than any running back in the league, and the defense was a problem even before letting go of DT Damon Harrison (last year), DE Olivier Vernon and S Landon Collins. So Eli will be forced into a lot of pass attempts, just like he was last season when he ranked eighth in the league. The difference this time is Odell Beckham and his monstrous 28.5 percent target share are no longer around. That brings us to Evan Engram, whose 64-722-6 line in 2017 was unheard of production for a rookie at the tight end position. Perhaps it’s because Engram looks and moves like a wideout. He ran a 4.42 with an eye-opening 36-inch vertical leap and 6.92 second 3-cone at 6’3″, 234 pounds. 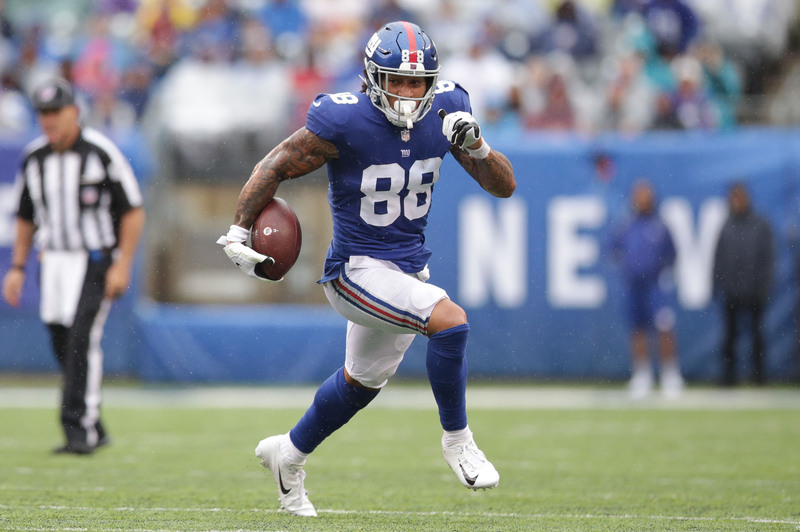 In 15 games without Beckham over the last two seasons, Engram has 76 catches, 945 yards and six touchdowns. At the annually shallow and low-floor tight end position, Engram’s floor/ceiling combo already sticks out in a big way. Carr never truly felt comfortable throwing to Amari Cooper, as evidenced by the exceptionally low red-zone target preferences and catch rates. But once Cooper was traded away last season, Carr was left with the corpse of Jordy Nelson and borderline NFL player Seth Roberts as his starting wideouts. The Raiders also had the No. 25 offensive line in terms of pass protection, per FootballOutsiders. The jury is still out on if Carr is actually #good or not, but it would have been very difficult for any quarterback to succeed in that situation last year. This season, Carr will have far fewer excuses. Although new Raider Antonio Brown is declining, he’s still among the game’s truly top-tier wideouts. Free agent acquisition Tyrell Williams ranks fifth in yards per target since 2015, behind only Rob Gronkowski, Tyler Lockett, Tyreek Hill and Julio Jones (via Ian Hartitz). The Raiders have also made a big upgrade on the line by landing LT Trent Brown on a $66 million contract. A year ago, many people were convinced Eric Ebron would never amount to much in the NFL. He settled for a what was essentially one-year contract with only $6.5M in guarantees and went on to blow up for 13 touchdowns. Although Devin Funchess doesn’t have the same raw talent as Ebron, he still enters the pristine situation Ebron found himself in last year after Jack Doyle went down. Andrew Luck proved he can play at an extremely high level despite his shoulder issues last season, finishing second in passing touchdowns and fifth in passing yards. He did that with the likes of Chester Rogers, Ryan Grant and Dontrelle Inman as his No. 2 wideout. While Funchess isn’t a world-beater, he’s a big upgrade on those guys and gives Luck another red-zone option along with Ebron. An eye-opening 21 of the 6’4/225 Funchess’ 161 catches in Carolina went for touchdowns. It’s time for the Chargers to let 2017 No. 7 overall pick Mike Williams spread his wings. He’s only caught 54 balls in 26 NFL games, but showed unique playmaking ability last season by turning 10 of his 43 catches into touchdowns and averaging 15.4 yards per reception. He did it while only topping 60 snaps in a game twice all year. Playing time will not be an issue this year as Williams projects for an every-down role opposite Keenan Allen, while Travis Benjamin plays the situational No. 3 role. Williams was 39th among 86 qualifying wideouts last season in yards per route run and was 4th among all wideouts in fantasy points per touch. Of course the touchdown rate will drop sharply, but a bump in projectable and bankable volume will help mitigate that regression. The Eagles sorely lacked downfield playmakers on offense last season. Zach Ertz set a career-high in catches with an outrageous 116 but also set a career-low in yards per reception (YPR) at 10.0. In fact, as a team the Eagles ranked 24th in YPR. The addition of DeSean Jackson is massive for Carson Wentz not only because D-Jax annually makes his quarterbacks numbers better, but also because it places everyone in spots they win. Nelson Agholor has stark splits when operating out of the slot – which is where he’ll be now that D-Jax bookends Alshon Jeffery. Ertz and mega-talent Dallas Goedert will see their YAC numbers rise as safeties clear out of the box to track Jackson’s speed. Furthermore, the Eagles have done nothing (yet) to address their barren running back room currently topped by Wendell Smallwood and Corey Clement. 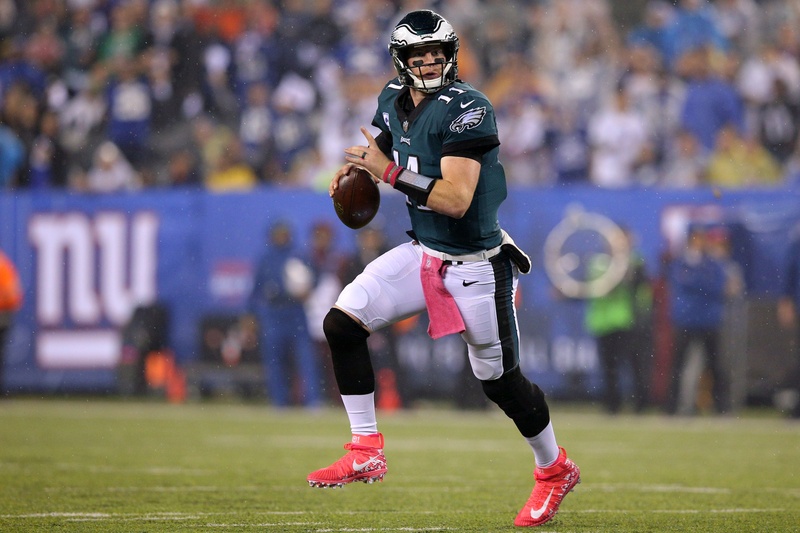 Wentz, who may have rushed back too soon from his 2017 ACL tear, should be closer to 100 percent for Week 1 this season. The Steelers led the NFL in raw pass attempts last season and also led the league in passing ratio inside the red-zone. Will their pass-happy ways decline now that Antonio Brown is gone? I’d project slightly, but Ben Roethlisberger isn’t going to spend perhaps his final season handing it off. The departures of Brown and Jesse James opens up 207 targets and as we saw last year, James Conner’s target share of 12.7 percent pales in comparison’s to Le’Veon Bell’s. Moncrief, still just 25 years old with 4.40 speed, will be battling with James Washington for market share behind slot man JuJu Smith-Schuster. It will be one of the training camp battles I’ll be watching closest. Tevin Coleman only cost the 49ers two-years and $10M. Still, that was too rich for the Falcons, who clearly feel good about 2018 fourth-round pick Ito Smith. They’re left with only Smith and underwhelming Brian Hill behind Devonta Freeman, who is coming off both a foot injury and groin surgery. Even when Freeman was healthy back in 2017, he only averaged 14.0 carries per game while Coleman got 10.4. At worst, we can project Smith for 150 carries and 35 targets. If Freeman’s health fails him again, Judge Ito will be looking at a lot more.